SAN DIEGO, Calif. – Yesterday, San Diego Asian Americans for Equality (SDAAFE), along with five families and Citizens for Quality Education San Diego, filed a comprehensive motion for a preliminary injunction with hundreds of pages of supporting evidence in federal court in their case against the San Diego Unified School District and its superintendent and board of education. In April 2017, the SDUSD Board of Education adopted an “anti-Islamophobia initiative” to combat the purported bullying of Muslim students and their families. 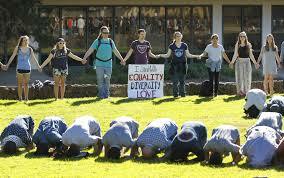 The Initiative, which was developed in partnership with the Council on American-Islamic Relations (CAIR), singles out Muslim students for special accommodations, calls for changes to school curricula to make it more favorable to Islam, and allows CAIR officials into classrooms to teach students about Islam and “how to be allies” to Muslim students. The District purchased thousands of dollars of CAIR’s recommended teaching materials, which were then distributed to the schools. In May 2017, the plaintiffs sued, alleging that both the Initiative’s religious favoritism and the District empowerment of CAIR to indoctrinate students violate the Constitution and multiple state laws, including the Unruh Civil Rights Act and California’s Education Code. In response to the lawsuit, the SDUSD Board purportedly rescinded the Initiative at a July 2017 board meeting and adopted a policy that focuses on protecting all students. Despite publicly claiming to have severed ties with CAIR, documents disclosed in a public records request show that District officials, including Superintendent Cynthia Marten, met with CAIR officials the very same day of the board meeting to continue the Initiative in a less formal, restructured format. The Freedom of Conscience Defense Fund (FCDF) is representing the plaintiffs. Yesterday’s motion is asking the court to halt the Initiative and shut down CAIR’s involvement in the District. This case is a tale of two iniquities that—absent an injunction—continue to fester in the San Diego Unified School District. First, in light of Defendants’ “anti-Islamophobia initiative,” it is a far graver sin for a bully to tug on a Muslim student’s hijab than it is to knock off a Jewish student’s kippah. Second, Defendants have chosen to politicize the schoolchildren entrusted to their care rather than cut ties with a notorious sectarian association. Defendants insist, however, that their “holistic” campaign against the purported “Islamophobic” children in District schools is simply part of their efforts “to protect all students from bullying.” Not only is that illogical; it is Orwellian. Indeed, to paraphrase Animal Farm, a high school English class staple, Defendants are merely claiming that all students are equal, but some students are more equal than others. SDUSD is one of the most diverse school districts in America. But our Nation is not divided by race or religion but united by the sacred principles enshrined in the Constitution. Among these principles are government neutrality in religion and the right of every American, including schoolchildren, to equality under the law. Unfortunately, this politically correct ‘anti-Islamophobia initiative’ runs roughshod over those principles. The superintendent and school board cannot hide behind a veneer of good intentions. Their actions and policies and run afoul of the fundamental constitutional mandate of government neutrality in religion. For the Supreme Court has made clear that government cannot affiliate itself with any religious doctrine or organization and it cannot discriminate among persons on the basis of their religious beliefs and practices. SDUSD has a constitutional obligation to keep divisive forces like CAIR outside of its schools. Our clients, as well as the vast majority of the San Diego parents, are deeply concerned that District officials would continue to partner with CAIR secretly. But it’s not surprising—CAIR officials themselves have testified that they have a religious obligation to try to convert schoolchildren to Islam, and they’ll stop at nothing to do so. Unfortunately for them, we’re equally committed to defending the Constitution in response. SDUSD has 14 days to respond to the motion. A court hearing on the motion will likely take place within two months. Led by nationally recognized religious liberty attorney Charles LiMandri, the Freedom of Conscience Defense Fund (FCDF) is a team of pro bono trial lawyers who protect the First Amendment rights of people of all faith or no faith.